The powerful Bobcat MT52 Mini Track Loader Rental is available for rent from the Duke Company in Rochester NY, Rochester NY, Buffalo NY and Western New York. 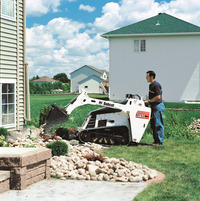 This innovative loader, manufactured by the renown Bobcat, is a powerful skid steer loader that can easily travel through tight spaces including backyard gates and other tight spaces. Rated Operating Capacity: 520 pounds. High and Low Speed: 3.5 miles per hour. Reach at Max. Heigh = 18.2 inches. Track length on the ground: 34 inch. The Duke Company rents rents the Bobcat MT52 mini-track loader by the day, week and month. Call 585-292-9870 (Rochester NY) and 607-347-4455 (Ithaca NY) for a price quote and to arrange prompt pick-up and delivery. Call the Rental Equipment and Tool Rental experts for price and availability.